Get to know Your GOLF BODY better! YourGOLFBODY is a physiotherapy service to help Calgary’s golfers understand what they can do to improve their golf performance, prevent injury and rehabilitate an existing injury. 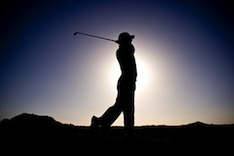 Golf has many factors that influence the player’s performance including: Technique, Athletic Ability, Equipment, Mental Game, Course Management, and Physical Ability/Inability due to injury, age, poor fitness. YourGOLFBODY evaluation is based on Titleist Performance Institute principles, as well as, physiotherapy training on assessing specific areas that can be limiting your ability to make the most efficient golf swing you can. These areas can include: muscle strength and length, increased/decreased joint mobility, proprioception/balance and functional movement of the body as a whole. Understanding your own GOLFBODY will allow you to focus on areas that will help you perform at your highest level and prevent injuries. A Medical Professional, like a physiotherapist, collaborating with a Golf Professional to look at technique, Club Fitters to properly fit equipment, and Fitness Professionals to guide conditioning, is encouraged. Understanding YourGOLFBODY and the Factors that influence your game is key to improved enjoyment, performance, and longevity of this great game of golf!